Some companies, however, are completely reimagining what email marketing can do and what it should be about. These companies don't believe email marketing is about direct sales; rather, it’s about delivering value that’s relevant, consistent, useful, timely, and personal. Basically, these brands are writing emails you actually want to read. It sounds like something that should be simple to pull off, but it’s not. In this post, I've rounded up the companies that have impressed me the most with their email marketing tactics, and identified what makes each tactic work. Joanna Wiebe is one of the best copywriters in the business. She’s made a science out of an art form, and an art form out of raw data. So it’s no surprise that she’s cracked the code for what makes people want to open every email she sends. 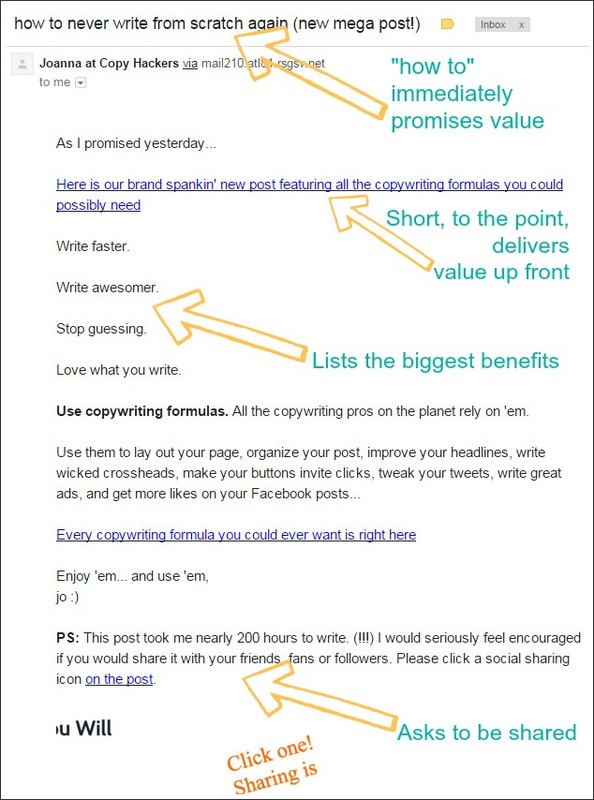 What is surprising is how simple it is: Every Copy Hackers email contains a helpful, immediately actionable tip on how to improve their copy. Every single one. Even the ones that are selling her latest ebook, or her latest online course. Her emails never waste your time, and because of that, they get opened. In the example email shown below, I highlight numerous elements that add up to it being a winner. Also, Joanna’s emails are written in her signature personal, friendly, casual and positively delightful tone, which doesn’t hurt, either. 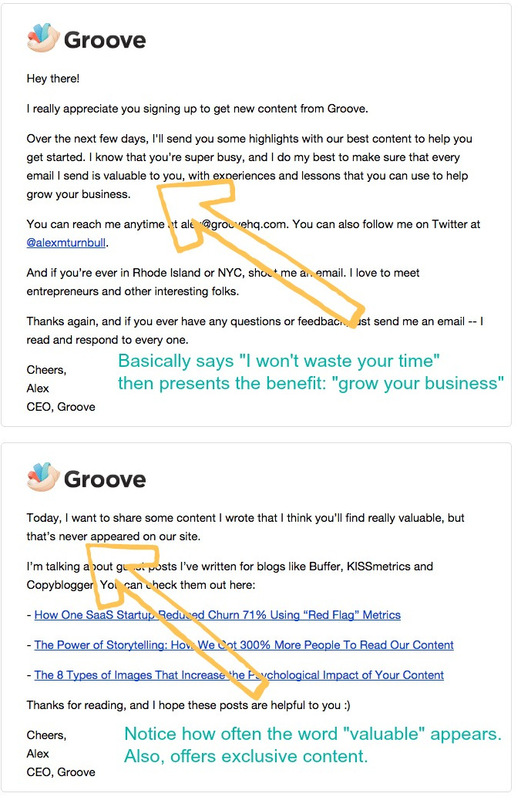 GrooveHQ provides help desk software, and their emails are always chock full of great information. Most of their emails aren’t trying to sell anything. 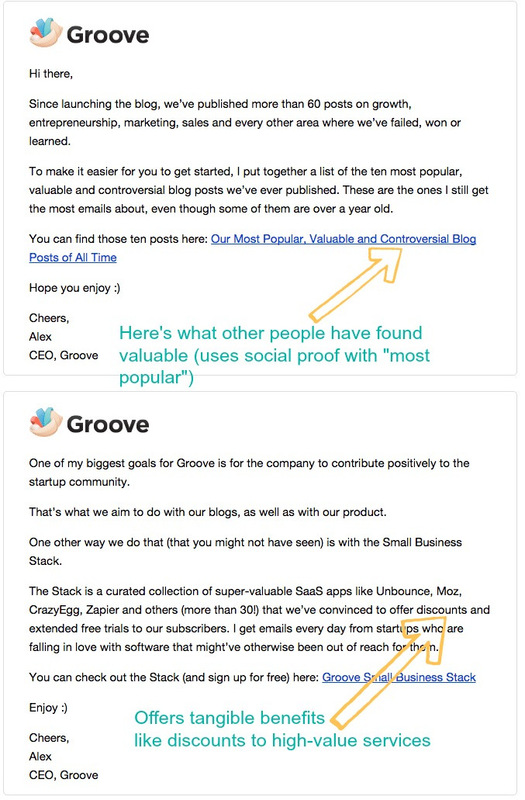 They're simply sharing with you an epic post they've written or a way to use Groove you might not know about, and telling you why you’d benefit from taking a look. Their emails are very benefits-focused, which is why it feels perfectly natural to click open their email and click through to their site in pursuit of the promised benefit. But this tactic wouldn’t work if they didn’t consistently deliver, and they do. 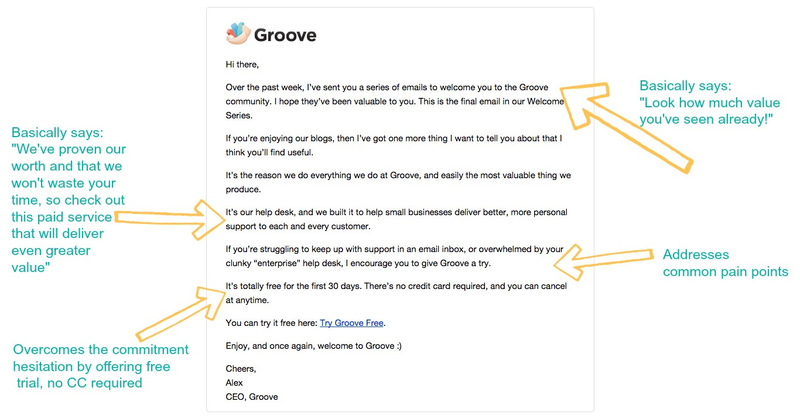 Building their email list has been a priority for GrooveHQ from the start, and they tried many different tactics trying to optimize their marketing efforts. What they eventually found worked best for converting visitors into customers, however, wasn’t their emails. It was their blog. Each post and email is written in a very genuine, person-to-person way. You feel like you’re in the trenches with them as they learn to navigate the wild and wonderful world of startup success. So you start to feel like you are part of their team, and then you start to act like you are. You’ve probably read about action-triggered email sequences. Even if you use them, you probably don't use them quite as well as TripAdvisor does. 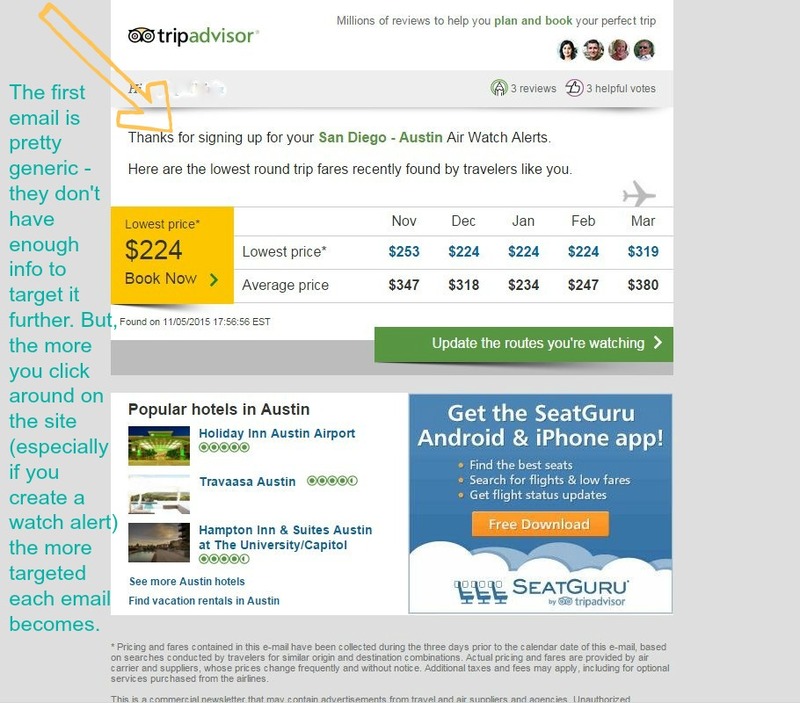 Each email in their sequence is created and triggered in response to a customer's specific action, and customized so much that no two TripAdvisor users will see the same emails. Each email you get is more and more personalized as you use the site, which means each message is more relevant to what individual customers want than the previous message. For example, in the first email you get from TripAdvisor, they don’t know much about you yet, so you might see a list of flight deals to popular locations from your home city. But if, for example, you click on flights to Austin, you're likely to start seeing hotels and attractions in Austin and surrounding areas. If you include travel dates, they’ll customize the email sequences around the dates of the trip. TripAdvisor's emails are some of the smoothest out there, grabbing you when you may not even be sure you want to take a trip, and then giving you every reason in the world to take one. What's more, their technique of getting customers to invest in the site by creating valuable content is successful. What they do is ask customers to help their peers by reviewing their own travel experiences. Most promotional emails stink. Evernote actually manages to produce effective, eye-catching promotional emails people don’t mind opening. 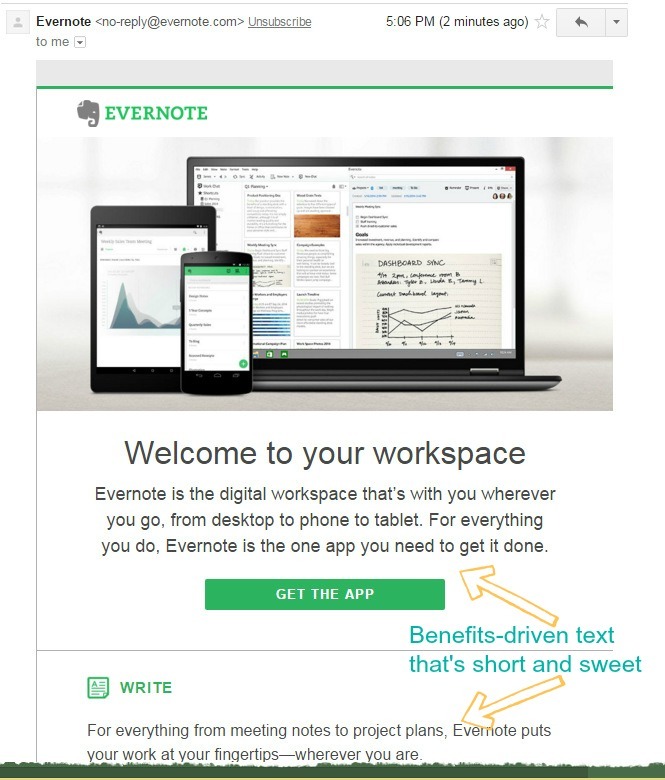 Evernote’s promo emails expertly highlight benefits first and foremost, before they mention features, and well before the call-to-action (CTA). Each email targets one specific benefit. So, rather than display every toy in the store, Evernote frames each promo within the context of one problem. Then they wrap one really great, simple solution to that problem in a warm hug of benefits-driven copy. As you can see, the copy is short, sweet, and full of action-oriented verbs. Also, their CTAs are big and bold. You can’t miss them. The examples of email marketing tactics I've just shown you are as varied as they are successful. I'd be very interested to hear your thoughts on these tactics and any others that may have caught your eye.